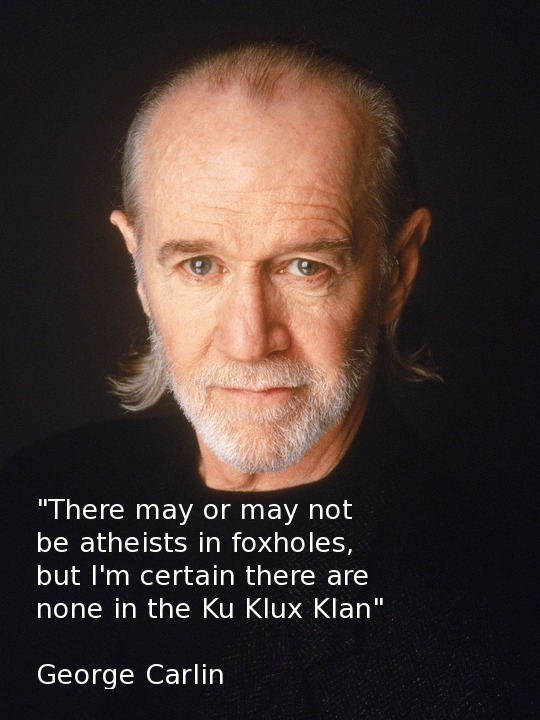 Is there any truth to the old saying, "There are no atheists in foxholes?" Panderbear is unaware of any statistics on the religious views of military personnel confined to those at the pointy end of the stick - those in direct conflict. However, an atheist-themed event "Rock Beyond Belief" held recently at Fort Bragg, North Dakota drew hundreds of attendees. Organizers of the the event stated their purpose was to draw attention to unequal treatment of the approximately 295,000 non-believers in military service. Official Department of Defense policy declares service members have the right to believe in any or no religion. However, many at the event claimed harassment in the military community for being non-believers. Some feared being passed over for promotions if their religious views were common knowledge, much as homosexuals were discriminated against in the military, at least until the recent end of DADT. The Fort Bragg garrison commander who approved the event stated, "We don't treat soldiers who are atheists as atheists," said Col. Stephen Sicinski. "We treat them as soldiers." Official DOD policy and garrison commander orders notwithstanding it is likely those prejudiced against non-believers proffer the same harassment as homophobes dealt to their homosexual comrades in arms. Atheist men and women serving their country deserve respect, not discrimination. Noted atheist and author of "The God Delusion," Richard Dawkins who spoke at the event received an enthusiastic response to his declaration that you do not have to be religious to be moral. Panderbear would add that you do no have to be religious or heterosexual to be patriotic and willing to give your life for your country.